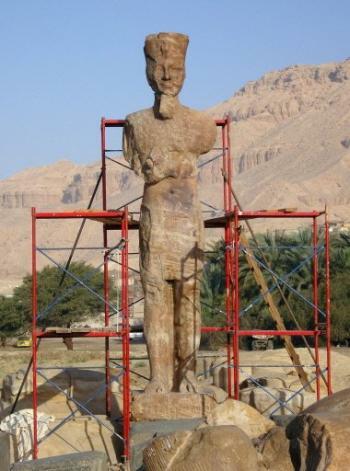 The Colossi of Memnon, two giant statues of pharaoh Amenhotep III guarding the entrance to his funerary temple in Thebes, will soon have company. Thanks to a huge donation from cognac heiress Monique Hennessy, archaeologists have discovered four other Amenhotep colossi, two made out of red quartz and two out of extremely delicate alabaster. The red quartz ones will be put back up next year. The alabaster ones will take longer due to their fragility. two sphinxes, 84 statues of the war goddess Sekhmet depicted as a lioness, and a stele whose 150 fragments were spread across a site which has to be constantly drained. It is planned that five years from now the statues of Sekhmet the lion-headed goddess will stand again. The tenth annual dig, which ends this month, has already unearthed a 3.62-metre- (11.9 feet-) tall statue of Tiya, Amenhotep’s wife. “She has an extraordinary beauty”, Sourouzian said. When the two 15-metre red quartz colossi of Amenhotep become upright again in 2009 Tiya’s statue will once again stand next to those of her spouse. This will be the only temple in the neighborhood with intact statuary, so even beyond the wonder of the individual finds, their return to their former positions will be a great thing.